Tout près au centre de Rome, eviron un demi-heure avec la voiture, en parcourrent la route Cassia bis pour 25 Km et après la route provincial 4A (appelèe Settevene-Palo) pour 5 Km plus loin, on arrive à une belle maison de campagne avec une splendide vue sur le lac de Bracciano. La maison, très spaciese et confortable, c’est composèe d’un grand sejour avec la cheminèe, studio-bibliothèque, salle à manger avec une autre cheminèe et un four à bois, trois chambres confortables avec salle de bains, grande cuisine beaucup equipèe, penderie, salle billard, veranda et des autres chambres de services. Il y a le chauffage, air conditionné, hydromassage, deux TV au plasma, alerte et porte automatique. A l’extérieur il y a un parc de 25.000 mq avec des arbres ornementals et de fruit, avec une piscine de 60 mq, une petit maison pour les outils, une petit bergerie et un bucher. nous avons résidé en bordure du lac de bracciano . Très belle maison avec de très belles prestations . Une superbe vue sur le lac. Maison très vaste . Piscine adaptée . Un agréable séjour dans cette maison pleine de charme. La cuisine n'est pas très fonctionnelle pour 10, mais on oublie vite devant la très jolie vue sur le lac et la piscine. Rome est accessible par le train depuis la station d'Anguillara (10 minutes en voiture puis 45 minutes de train). je vous remercie beaucoup pour l'examen positif, et surtout pour le grand soin avec lequel vous avez gardé notre maison, même si vous étiez dix personnes. Vous avez été parmi les invités les plus agréables que nous avons eu, et nous ésperons que vous reviendrez chez nous. James C.I am Scottish and live in Aberdeen. The family really enjoyed their stay at Villa Le Rondini. The location and views were fantastic. The children could not be kept out of the pool which was terrific. We even had our own pool olympics. The villa had all the facilities we could wish for and it was very spacious, which we needed for 9 of us. One thing which could be improved is the air conditioning. A lot of the rooms had air conditioners, but they appeared to need re-charging with refrigerant as they did not cool the rooms. There were several good restaurants in the area, the best was Il Capannone, which had a great menu and the views from the restaurant were nice. Trevignano Romano was nice and we enjoyed a couple of festa days there. Places like Bracciano, Anguillaro and Sutri were close and nice to visit. One gem we found was the Civita Bagnoreggio, a really lovely town to see and most unusual. Simonetta and Gianni were a lovely couple and always available to help us if necessary. My best wishes and many thanks to them both. 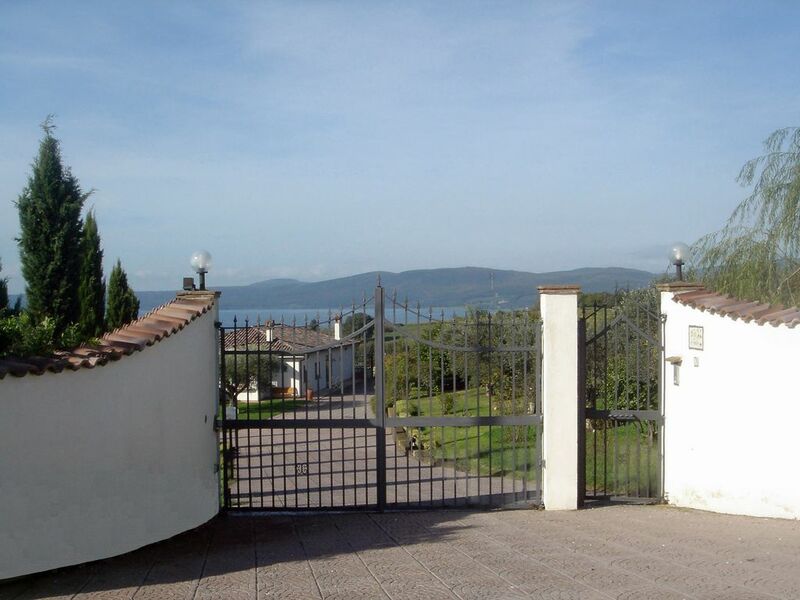 Wonderful villa, stunning views, great base for visiting Rome and lovely owners. The villa has everything one could need for a wonderful holiday - plenty of room for 10 people, great pool, large and well equipped villa (jacuzzi and pool table - and the wi-fi kept the kids connected) and has a stunning view over the lake from the covered verandah and pool area. Completely private and secure with a huge enclosed garden area. The views from the verandah were such that we spent almost all our time in the villa there dining and relaxing with the view over the pool to the lake beyond. Gianna and Simonetta are lovely hosts and all queries were dealt with promptly and the whole process of booking the villa and our stay was made a pleasant experience. With easy access to efficient rail services into Rome (40 minute rail trip) the villa is ideally located as a base to visit all the Rome attractions as well as the immediate areas of Trevignano with a many restaurants, Lake Bracciano beaches, Castle at Bracciano, Sutri and the ancient roman amphitheatre, the aqueducts at Nepi, and the ancient mountain top village of Calcata all being within 30 minutes drive of the villa. Less than an hour to either Rome airport - car needed to make the most of your stay. We wanted a place for a special family holiday - all 9 of us - and Villa Le Rondini provided the ideal place for a family holiday that we will never forget. Would not hesitate to return one day and would recommend the villa to anyone else looking for a stunning holiday base near Rome. thanks so much to you and your family for the beautiful words you said about our home and us. We (4 adults and 5 children, age 4 to 10) stayed in this beautiful villa for two weeks. The suroundings are incredible, the view changes throughout the day and we spent much time just looking and enjoying the peace and quiet. The kids loved the pool and spent most of their time there. The house is big with 5 bedrooms and 4 bathrooms, more than enough space for two families. It is also well equipped. Simonetta and Gianni are lovely people and they were quick to answer all our questions. We are 2 families with teenage children who holidayed together at the end of July. The villa is set in stunning scenery in the countryside overlooking the lake. It is incredibly spacious and very well equipped. We ate breakfast in the huge covered verandah every morning and swam in the generous floodlit pool each evening. The villa is an ideal base to explore the area and we made easy trips out to the beach at San Severa, Rome and the charming town of Sutri. Simonetta and Gianni were welcoming hosts who sorted out all issues promptly and with good humour. It was very hot during our stay and it did take us a while to work out how to keep the bedrooms cool as the air conditioning is only on the verandah. The lakeside town of Trevignano Romano is a short drive away and has a supermarket and a wide choice of restaurants. There are also good restaurants outside the town but you do need a car to make the best of the area. If you have teenagers like us and are travelling from abroad, be aware that there is Internet access for mobiles but not free wifi. We had a lovely holiday with an excellent balance of sightseeing and relaxing in this beautiful unspoilt area. We would love to return some day and would recommend a stay in this villa. We are so glad to have been able to share our house with such wonderful people as you and your family and your friends. It’s hard to capture the country home in pictures or in a description on a website, and the words of someone who actually stayed there would go a long way. Again, it was so nice having you, and we hope to have you back with your family or friends as our guests for other holidays. Environ à 6 km il y a le convenable pays de Trevignano situé sur le lac, où il y a des restaurants, le cinéma, des équipements sportifs (avec le petit port nautique), pour l’équitation, pour le trekking à pieds et avec la bicyclette. Environ 15 Km il y a les centres historiques de Bracciano ancienne ville médiévale avec le château des Odescalchi et Sutri ancienne ville étrusque riche des autres monuments et nécropoles. A 25 Km il y a les confortables thermes de Stigliano. Tariffe in funzione del numero di persone - Deposito cauzionale - Consegna delle chiavi da parte del Proprietario.